Firstly these recent posts are real time – finished just a day or two ago. The weather and waiting for a plumber keep other projects from advancing. We’re still in test-fit mode here at MisAdventures. I may not have a plan on paper, but it’s up here in my head somewhere. Even through formal plans are non-existent I just don’t run roughshod willy-nily with stone and wood – no, I do a lot of “what-if” test fits. 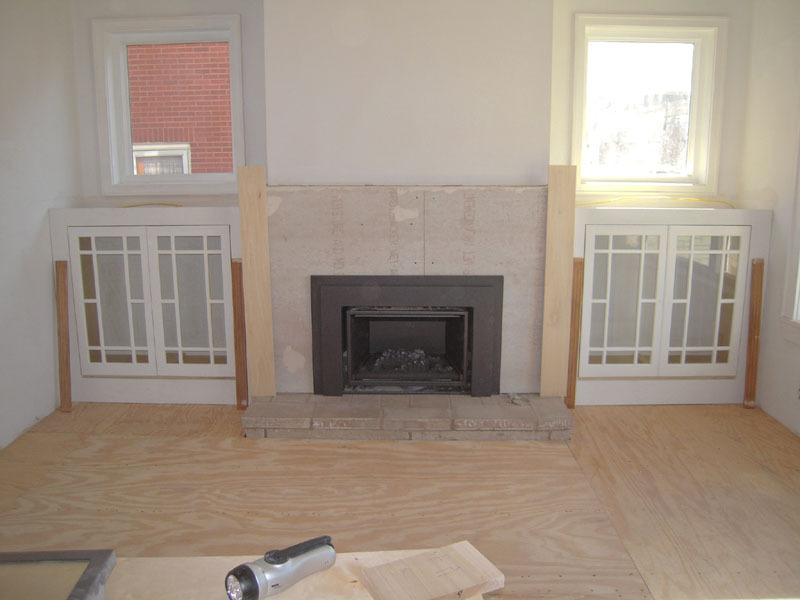 The cabinet boxes had to be smaller than the face frames to allow gas pipe and electric to be run to the fireplace. This side will have the gas – the other side will have the electric. This pipe has to go up and into the firebox. No – that valve will not be at this position. Originally, this valve was inside the fireplace – and that’s allowed by our local code. 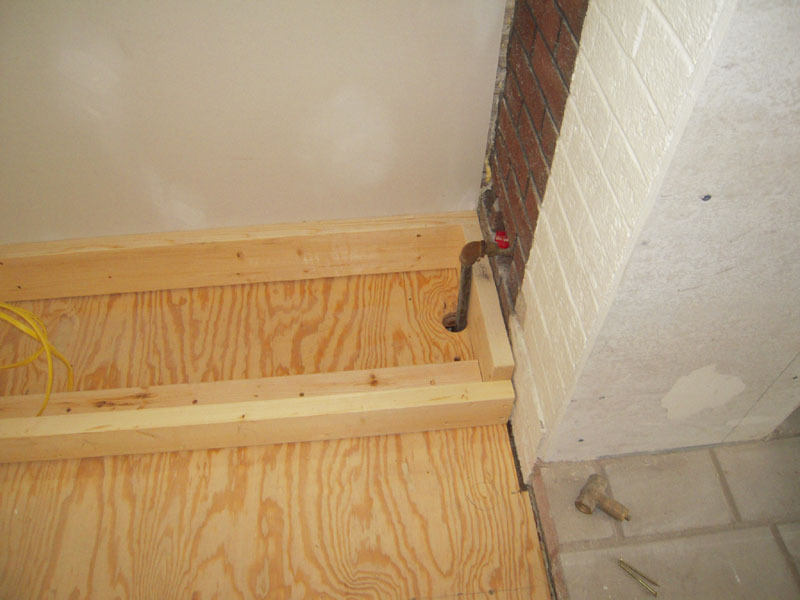 Not a good idea in my opinion, so we will have a shut off valve under the floor with a key next to the fireplace. We’ll know the layout when my plumber shows up. 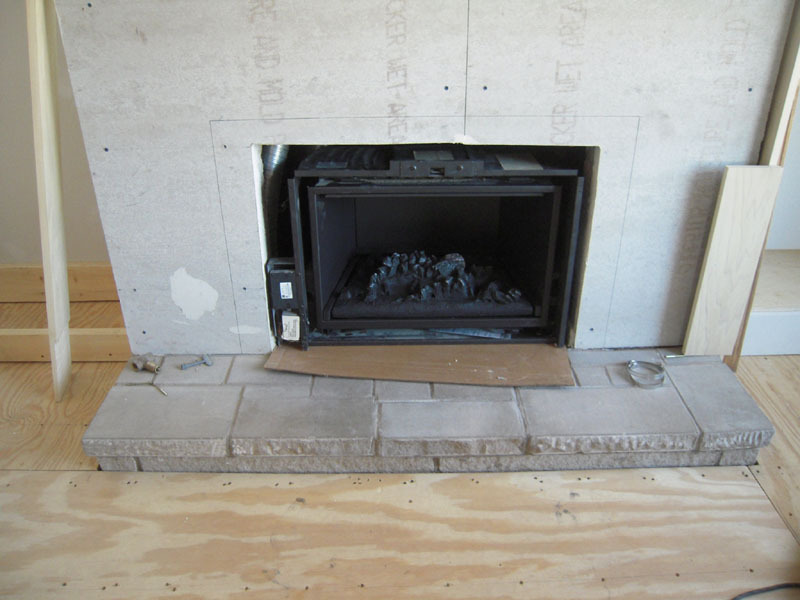 The first test fit of the fireplace insert. 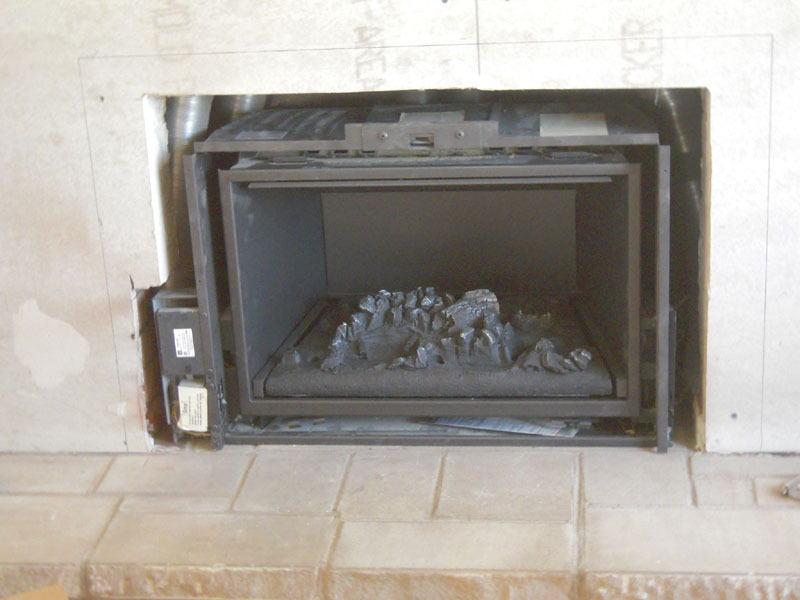 It’s a Regency L390E Direct Vent gas – and I already see a problem. The specifications show the width without that little box attachment on the left side. It’s an optional remote control module and it doesn’t allow the fireplace to sit centered. 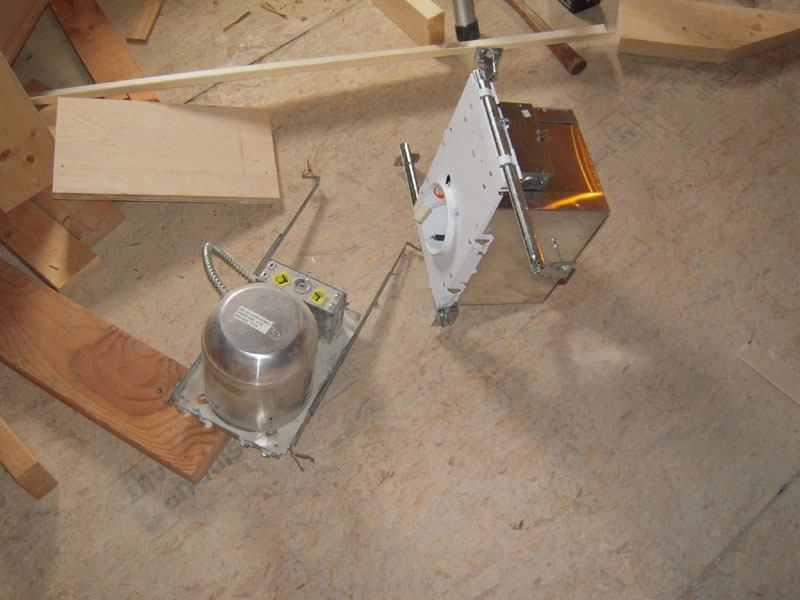 So out comes the diamond saw and we start making some more brick dust – and I thought I was done with this dirty stuff. After the notch I thought I might be done with the saw – but I think I’ll have to notch the top a little more because I have a new hearth going in over the original limestone hearth. Why would I cover up this vintage hearth you say? Well, I wanted to keep it – since I added limestone outside. But the hearth is pretty poor in the craftsmanship department. The right side is 1 1/2″ wider than the left side. It has pretty poor joints and really filthy stone. I sanded some and thought about taking it up and resetting it. But really – it looks like concrete. But after thinking about the big picture I have decided to add a honed black granite hearth to match the matte black fireplace surround. I’ll build a mantle and wrap the corners with casework. (Those sticks of wood are my substitute for a CAD drawing). 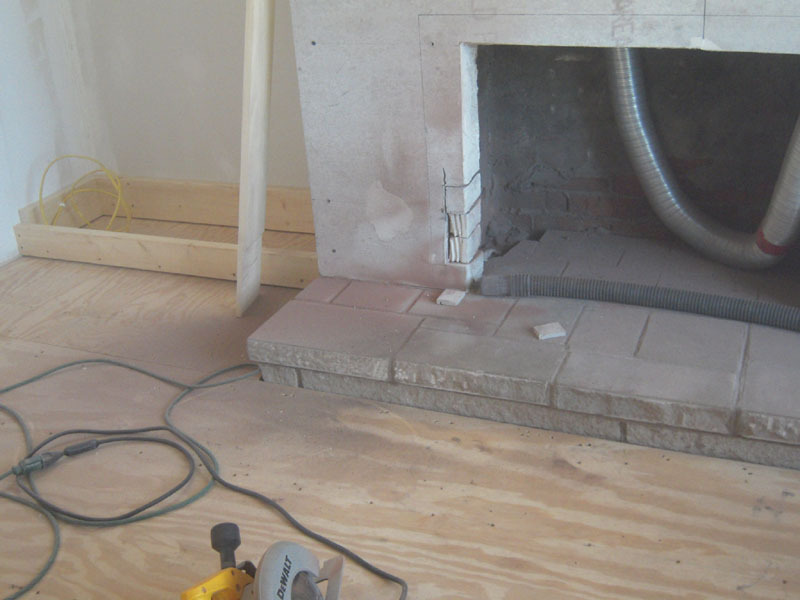 The surround between the fireplace face and those vertical sticks will be white marble and the tops of the cabinets flanking the fireplace will have matching marble tops. So this is where we are right now. You see I used the original cabinet doors for the design theme for all the exterior windows in the house – all 24 of them. 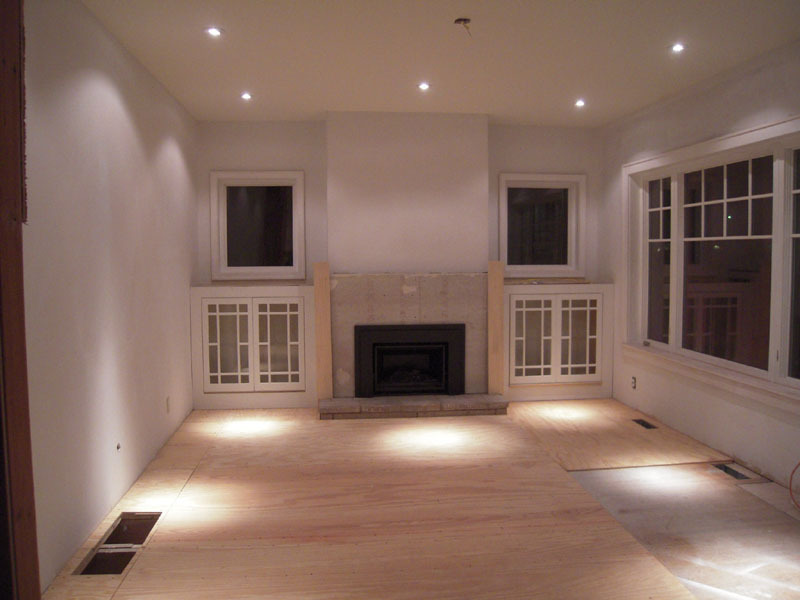 This room is 13’X18′ and the 9′ ceiling has 8 low voltage recessed lights.The wall color will be white – another white on white room. There is a lot of art going in here so the lights are fully articulated to effectively light the paintings. A vintage chandelier will go in the middle. So as I wait for the plumber to fit the fireplace and get the stone guys moving -hang in there we’ll get this room semi-finished and move on to the next. 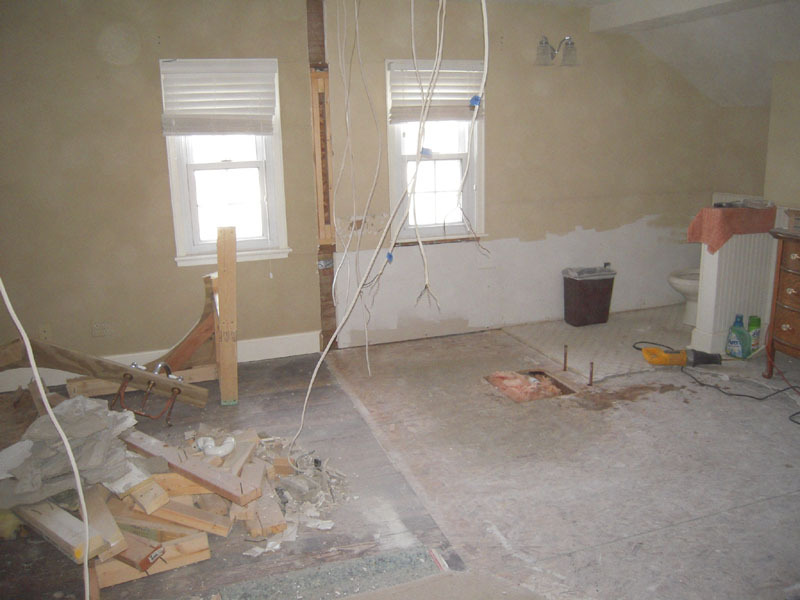 We left off last time with a very demolished room – the way I like ’em. We’ve got big plans for this room, I tell ya. We’ll combine the two previous rooms into one. We’ll fix the structure and combine those little windows into one big one. But it won’t be easy – as always, I get my best ideas right about time when it’s time to put on the paint. This space will not disappoint in that regard. 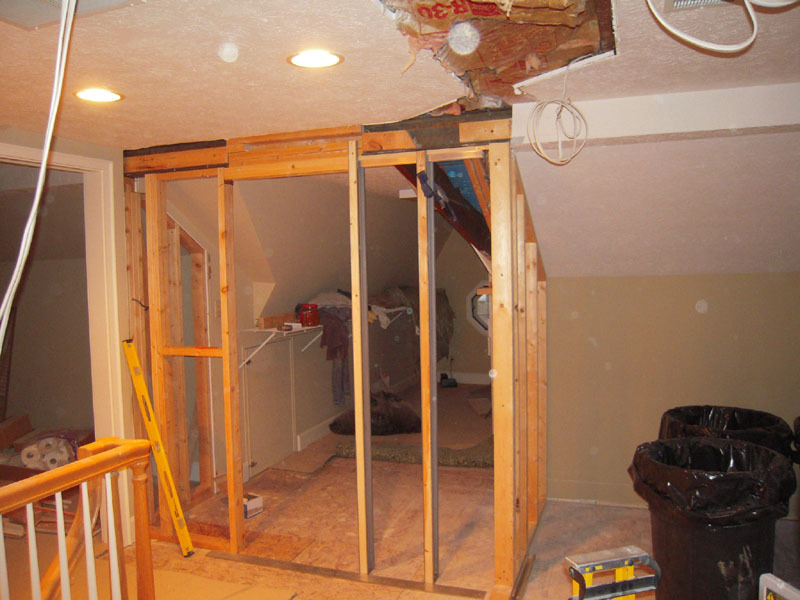 The flat topped master closet will be demolished and built a couple of times. Here it is before the first reincarnation. 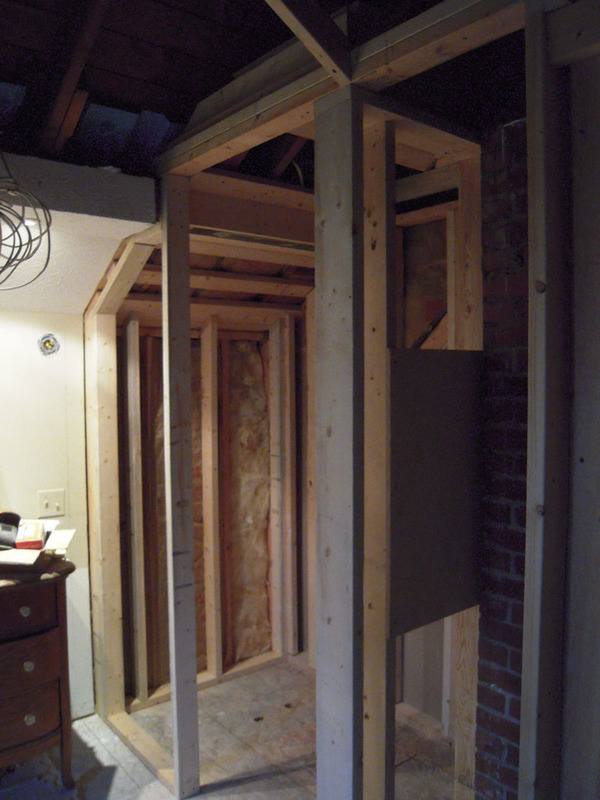 Here I’ve already jumped in with both feet and put up the closet wall and pocket door frame. This will be a waste of time. But it’s good practice – I am really good at framing pocket doors now. 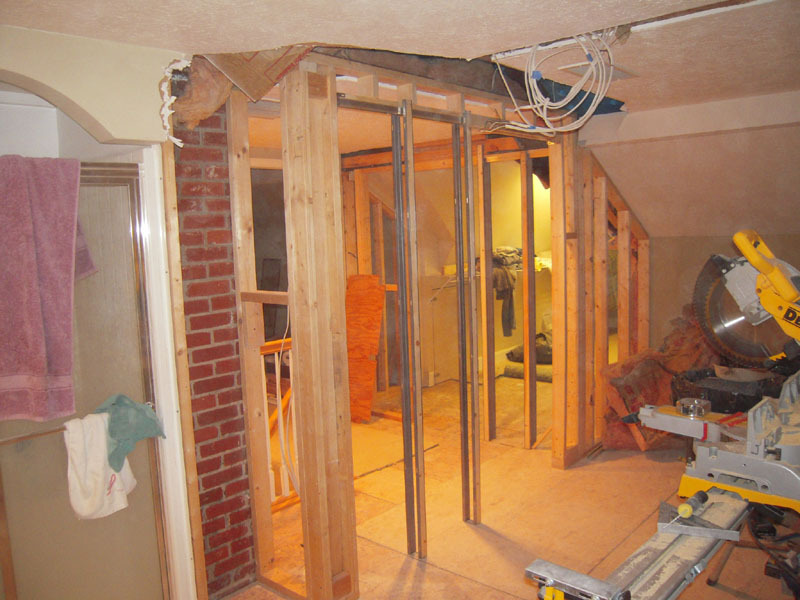 And the wall for the master bath – and another pocket door. I actually kept part of this wall in the final version. 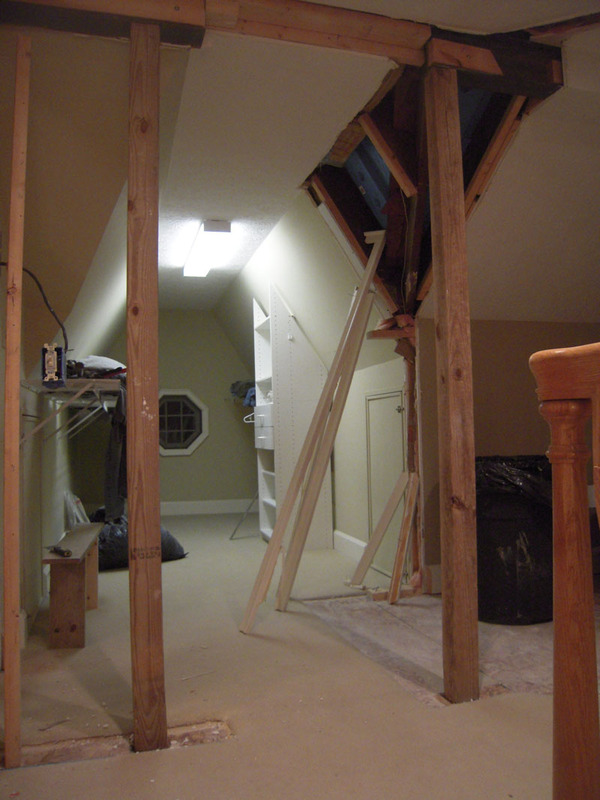 Now to get rid of the 7′ ceiling. 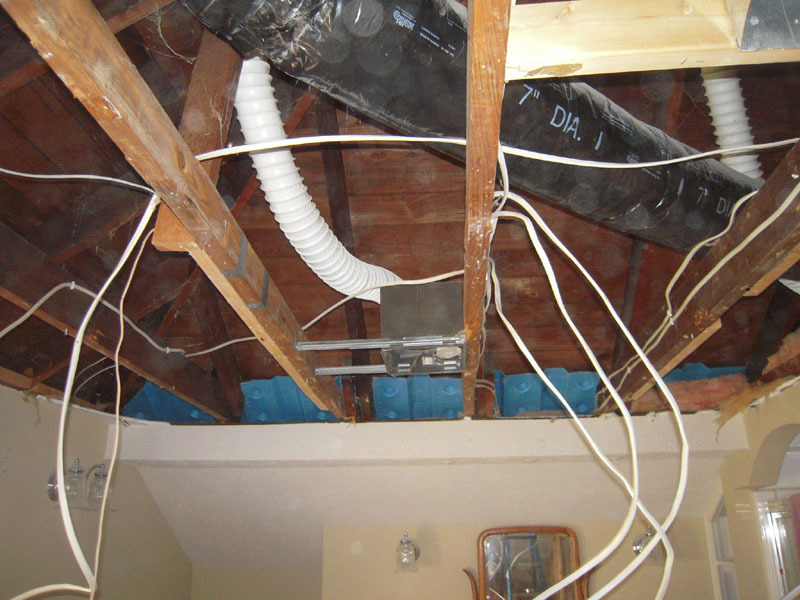 You can see the plastic dryer ducts for the bath fan – and the wiring quality is atrocious. 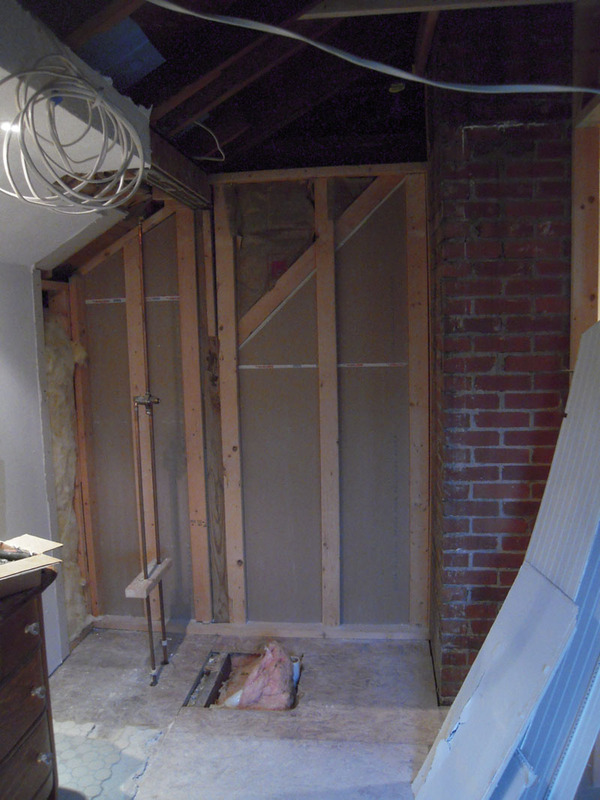 And we lose the fiberglass shower – all that remains is the plumbing. We’ll dispatch that shortly. 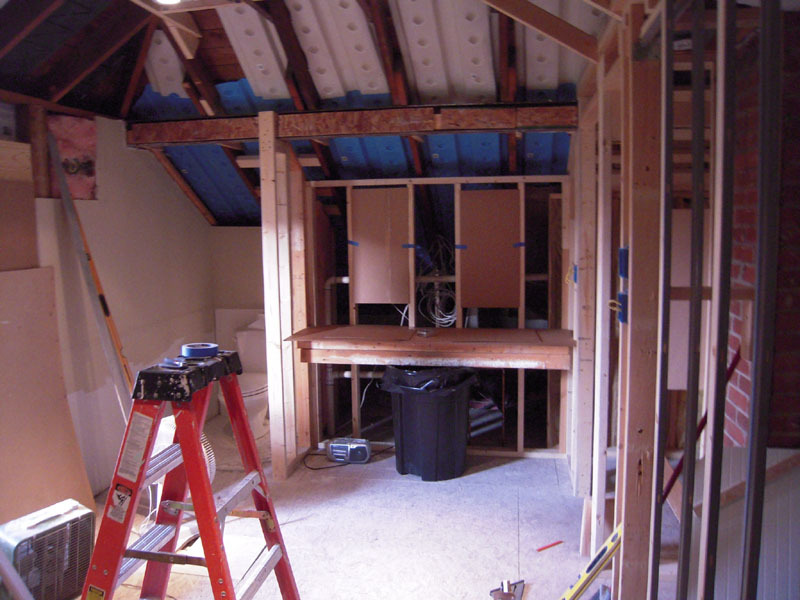 Here’s the 1st attempt at framing the shower. Notice the chimney is still in this photo. Things will change again before this shower gets finished. The good news is it stays in the same space – well, the general area that is. 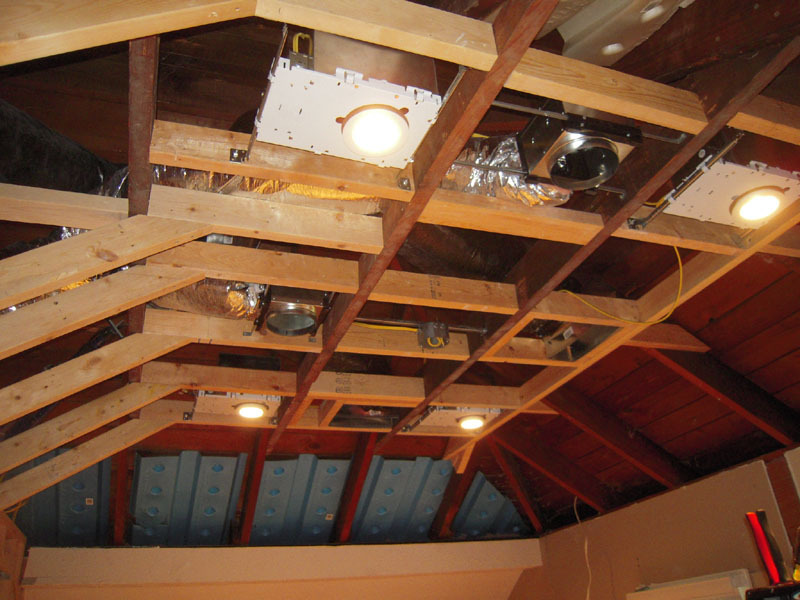 Pictured is a typical new construction recessed light fixture on the left. It’s non-IC rated. 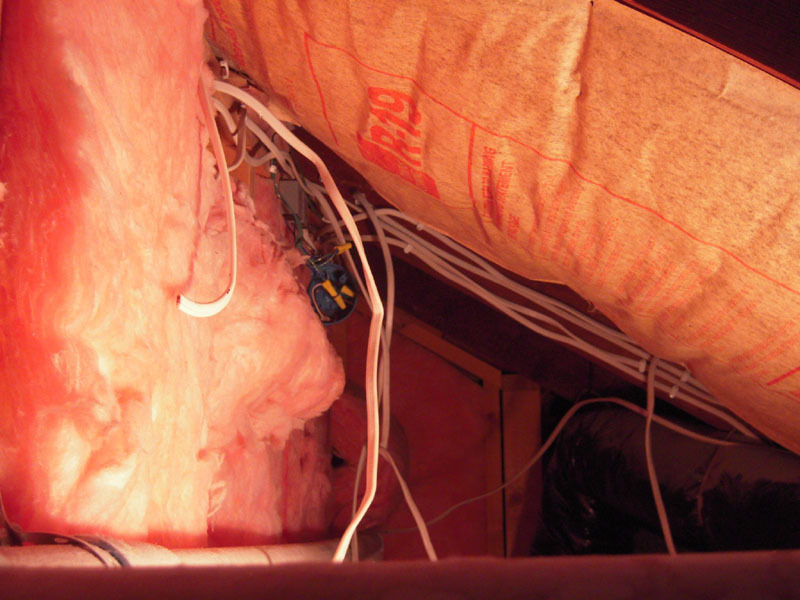 IC is “Insulation Contact” you must keep insulation 3″ or so away from these. The right one is an IC rated fixture. This is a 4″ low voltage recessed light with electronic transformer and Air-Tight rated.These do help with air migration through the ceiling. I used these through out this project. Last count was about 50 …so I’m getting pretty good at installing these things. Some people wondered why I re-wired my whole house. Here’s one example of stellar electrical expertise. Now you know why I replaced it all. An early vanity mock-up. I’m good at using cardboard and trash cans as stand ins for cabinets. I was trying the get the framing right for the twin medicine cabinets that go above the sinks. But it will change.